I guess when you've already heard the track, you're hoping for something new or "extra" when it finally comes out. Not much new here, but nice to finally be able to hear it properly on headphones. Must admit the cheering noises on both CHEMICAL and this track aren't really my cup of tea. I suppose they're used as a way of filling the space - a bit like say, the bongos in Go - but putting cheering on your own records feels a bit like self-praise to me. Am I being harsh? I would also love a rip of this! True, but this is what you get when you listen to album tracks in advance. Question is, would your perception of it have been different if you had waited for the album? Probably, but I saw them live a couple of months back. Was I meant to close my ears? I'm normally a hold-off-until-the-album kind of guy, but I want all of this so bad, I couldn't this time round. I am going to wait until tomorrow though, because I decided to live somewhere where it's still Thursday, and I'm OK with that. trust me when I say this. When you finally get to see the show, it wont matter anymore. try not to think of it as spoiling it for yourself. when you hear it live, it will be worth it. as for current and present listening, i change the eq and surround settings for my audio on my phone to give it a little more life to the song. Knowing the difference between the BITE tracks and their live versions compared to what they're doing with NG, I'm kind of glad it's mostly the same this time around, granted I wish they'd throw in some surprises in the studio versions, but nothing drastic like in 2015. And didn't you feel a little guilty after that? Nah, I was just messing around with ya. The thing is, hadn't it been usually the other way around where you got the album, then single releases and then you went to concerts where those songs were adapted for the ultimate live performance? The brothers are famous for their way of notching up their album tracks live, adding more depth or nuances to them. This is the thing though. Why did Justice go to all the effort of doing a studio version of WWW as a new album? Cause it was a reinterpretation of the latest music as well as the older stuff, and thats an exciting thing for a fan. I'm glad they did that because I wasn't 'satisfied' with the original album versions of the Woman songs. I just felt like they needed a little more. It can be a battle with art v commerce too sometimes with deadlines in this fast paced world. I noticed they lengthened the crowd cheering sample out during the rain/tears speech. (instead of having a short loop of the same whistling slightly cut off every 2 seconds) I kind of liked that it worked with the tears being repeated as well. Not a major thing though. Keep us informed ((it's 21:30 here). I don't know who's the chems PR but why would you want to put 3 YouTube teasers for this track? But I still really really love this track too much! 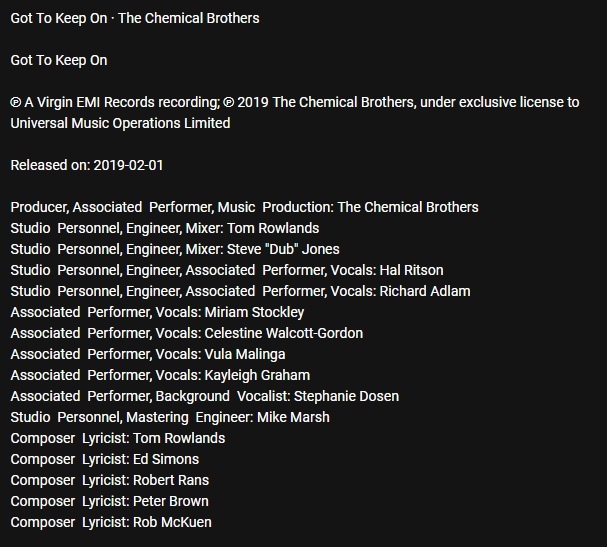 I hope they give this track the same treatment to MAH/ FY, meaning put out another single with GTKO (longer version hopefully with those missing parts I mentioned) and EOD on the other side! Make this happen T and E! Love, love, love this track. So woozy and psychedelic - and I love the random feedback/tears poetry build up right in the middle - so out of place, yet so right! Smashing work T and E - high hopes for the album now! Among the 3 tracks we have already heard from the upcoming No Geography album, Got To Keep On is not my favourite, but I understand its choice as the first single as it sounds more mainstream than Mad As Hell or Free Yourself.